The DeltaQuad has been designed as an industrial quality vehicle using the highest quality components. All components are rated beyond the maximum usage and have been tested to their extremes. Every DeltaQuad gets put through a rigorous testing procedure for which we have developed custom test and calibration hardware, and employ state of the art tools including thermal camera’s, thrust stands, high capacity calibrated current clamps and various meters, scopes and power supplies. Deans Wet Noodle wiring is used throughout the DeltaQuad. This high quality wire with an amazing 1660 strand count and high grade copper offers incredibly low resistance and stays cool even under the extreme loads the DeltaQuad can demand. After rigorous testing of many different types of wire the Deans Wet Noodle wire stood out as the best performing product on weight, load, heat and internal resistance. The DeltaQuad blind mate connectors are based on the industry leading Amphenol connector pins. These take high quality to a new level and are considered Mil Spec connectors. 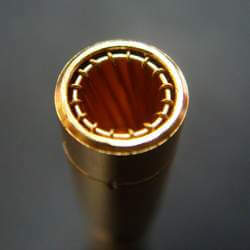 The gold plated pins and internally braided sockets provide the best quality connectors for both signal and power we could find. They have a low insertion force and will carry more power then the DeltaQuad requires, even under the most extreme circumstances. With the design of our custom connector housing, one of the core considerations was the expansion options. All connector housings have been outfitted with twice the amount of signal pin capacity then what is being used for core flight. Using our connector expansion set you can easily embed your own electronics in the VTOL nacelle or wing. Be it for customized landing lights, external sensors or your own landing gear, with the DeltaQuad connector system you can embed your own electronics while maintaining the ease of our blind mate connectors. The servos that control the wings elevons need to be strong, reliable and durable. 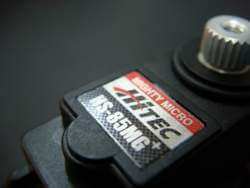 We have chosen to embed the Hitec HS-5085 metal gear digital servo for its reputation for quality, robustness and durability. The DeltaQuad houses these servos in custom designed servo housings that allow for easy replacement and solid attachment; the servo’s are screwed in place. The housing comes with a cover that protects both the linkage and possible damage to other components by shielding the sharp edges. The DeltaQuad is driven by its own bespoke motors. The DeltaQuad pusher motor has been specifically designed to run most efficient when spinning the DeltaQuads 12×8 propeller at cruise speed. 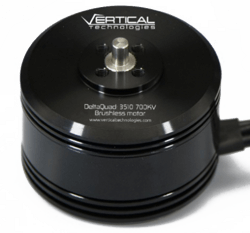 The DeltaQuads 4 high performance quad motors have been designed to pack enormous power while keeping the weight to a minimum. The self tightening propeller adapters ensure the propellers will not come detached during flight. These motors come from the same factory that produces many of the top grade UAV motors and uses the same components. High quality EZO bearings ensure these motors can face almost any environment and will keep performing at optimum efficiency for at least our recommended maintenance cycle. Every motor that is mounted on a DeltaQuad has been tested to its maximum to ensure that your vehicle can be flown safely and with optimum performance. Both board computers use industrial quality SD-Cards to store system and logging files. 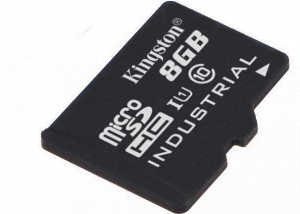 These sd-cards provide fast and more reliable storage then regular sd-cards, and are designed to operate under extreme temperatures. The sd-cards remain operational for more usage cycles and are easily accessible for quick transfer of log files. The cards are rated HC Class 10, feature up to 90MB/s transfer speeds and can operate temperatures from -40 to +85 degrees Celsius. They have been designed to be shock and vibration resistant. 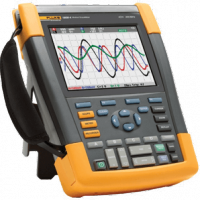 The have been tested to be compliant with military standard MIL-STD-883H, METHOD 2002.5 and feature IPX7 rating. The DeltaQuads primary flight controller is based on the Dropix flight controller and has been developed in cooperation with Drotek. The flight controller is based upon the widely used Pixhawk hardware design. In contrast to many of the existing Pixhawk based flight controllers this flight controller uses only industry standard Dupont/JR jumper connectors. These connectors have been the industry standard for many years due to their highly prove robustness and easy of use.